According to preliminary data published by America's National Weather Service (NWS), the temperature in Chicago dropped to minus 31 degrees Celsius (-23F) on Wednesday. This was their lowest temperature since 1985, when the mercury reached a record low of -33 degrees Celsius (-27F). When wind chill is taken into account, the temperature in Chicago was made to feel as low as minus 47 degrees Celsius on Wednesday, which is their fifth lowest wind chill value on record. According to the NWS, these conditions are capable of causing frostbite on exposed skin within 10 minutes. These values were current as of 8pm Chicago time on Wednesday. This week's deep freeze, which has flooded social media with images of icy cities and frozen lakes, is being attributed to a polar vortex passing over North America. 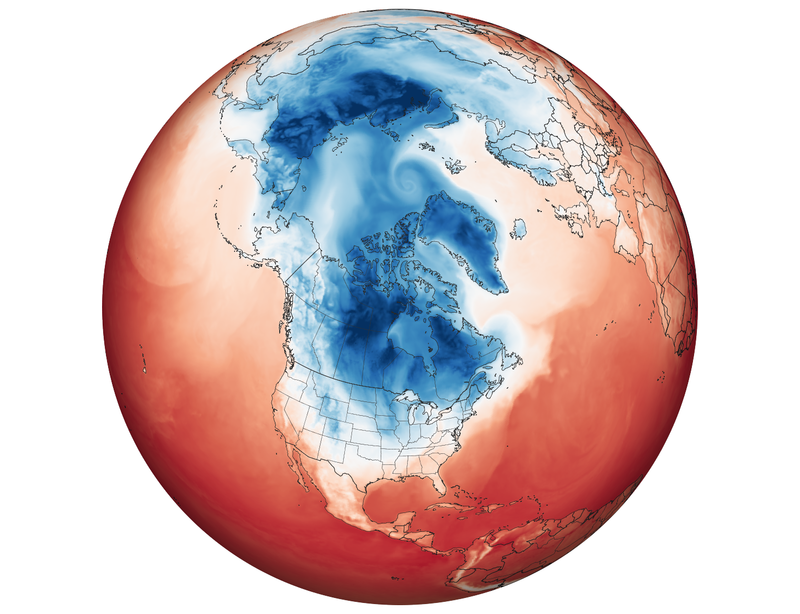 Image: NASA modelling shows cold polar air near the surface moving into North America on January 29th, 2019. A polar vortex, which is a real thing, is simply the term given to the masses of very cold air that sit over Earth's north and south polar regions. The 'vortex' part of the name refers to streams of powerful westerly winds that circulate each pool of cold air, which hold them in place near the poles. While the southern hemisphere's polar vortex is largely locked in place over Antarctica, the northern hemisphere's can meander over nearby countries during winter and send a surge of Arctic air across places like North America. Despite this week's record-challenging cold weather in parts of America, these low temperatures alone aren't proof that our planet isn't getting warmer. Research actually suggests that rising global temperature may actually be weakening the bands of powerful wind that hold the polar vortex in place. More research needs to be done before we can tell whether our changing climate will alter the behaviour of the polar vortex in the future. The term polar vortex has been around for decades, however it's only recently become popularised through increased exposure on social media. Weather = day-to-day state of the ATMOSPHERE (jetstreams play a vital role in that) and climate is the AVERAGE weather for a place over a period of time. Having said this - look at the overall trend in global temps because that clearly shows an increase in temperatures at a global scale.